Steve Nash is a South African-born Canadian retired professional basketball player. The athlete who is an eight-time NBA All-Star and a two-time recipient of the NBA Most Valuable Player Award has become a household name in Canada with the basketball world at his feet. Considered to be one of the greatest point guards in NBA history, Nash who has been playing basketball since high school made a successful journey from gym basketball to the world pro basketball with the Phoenix Suns in the NBA. Stephen John Nash was born on February 7, 1974, in Johannesburg, South Africa to Jean and John Nash. Steve’s father, John, was an English man who played professional soccer while his Welsh mother was a sports fan. John and Jean Nash raised exceptional athletes as Steve’s younger brother, Martin carved out a successful career for himself in professional soccer and his sister, Joann was also a standout college soccer player. Steve’s family had a globetrotting lifestyle. When he was only 18 months old, they first relocated to Regina, Saskatchewan, then moved to Vancouver, but later settled in Victoria, British Columbia. Following in his father’s footsteps, Steve played soccer and ice hockey as a child but after discovering basketball and playing in an organized league for the first time in eighth grade, he became passionate about basketball. Steve’s dreams were now geared towards becoming an accomplished professional athlete and an NBA star, but his skinny build made that goal seem quite unrealistic. Steve Nash attended Mount Douglas Secondary School in Saanich, British Columbia, but later switched to a private boarding school, St. Michaels University School where he participated in basketball, soccer, and rugby. As a junior at St. Michaels, he was named British Columbia’s most valuable player in soccer and in his final year, he led his school team to victory in the British Columbia AAA provincial championship. He played college basketball for Santa Clara University where he was awarded a scholarship for the 1992-93 season and became the first freshman to be named the ‘Most Valuable Player’ after the National Collegiate Athletic Association (NCAA) championship tournament. After graduating with a degree in sociology, and as Santa Clara’s all-time leader in assists, Steve was selected for the first round of 1996 NBA Draft by the Phoenix Suns alongside Kobe Bryant and Allen Iverson, marking the beginning of his professional career. He was with the Phoenix Suns for two years before joining the Dallas Mavericks. The 6 feet 3 inches tall athlete had a brilliant performance with the Mavericks and established himself as one of the best point guards in the NBA. However, he soon became a free agent after the 2003–04 seasons and returned to the Phoenix Suns for the 2004–05 seasons. In 2006, Nash was named the ninth greatest point guard of all time by ESPN. He performed excellently for the Suns such that they were named the highest scoring team in the 2009-10 seasons. Moreover, while leading the most dynamic offenses with both the Suns and Mavericks during the 2000’s, Nash led his teams to success reaching four Western Conference Finals. 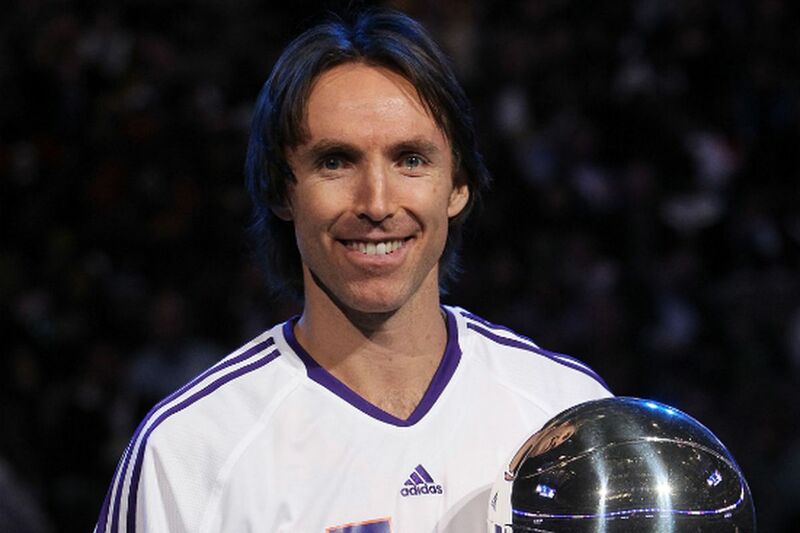 In 2005 and 2006, Steve Nash was named the league’s Most Valuable Player (MVP). He was traded to the Los Angeles Lakers in 2012 but his time there was marred by injury. He, however, led his team to a three-time victory, despite a leg injury in the second game of the 2012–13 season. Nash retired from professional basketball in March 2015. Ranked as one of the top players in NBA league history, Steve Nash led the league in assists and free-throw percentage at various points in his career. After retirement, he became a part-time consultant for the Golden State Warriors and was selected for induction into the Naismith Memorial Basketball Hall of Fame in 2018. Though an 8-time NBA all-star selection, 3-time All-NBA first team selection, and a 2-time MVP of the league, Nash is surprisingly a philanthropist who shies away from stardom. He is the founder of the Steve Nash Foundation, a charitable organization that focuses on child health and education services in Arizona, British Columbia, and around the world. Nash also founded the Jim Jennings Memorial Endowment Fund at SCU. More so, the basketball star is involved with a non-profit organization ‘GuluWalk’ which raises funds for the war-affected children of northern Uganda. Steve Nash’s philanthropic works have earned him several accolades off the court including, Officer of the Order of Canada, the Walter Kennedy Citizenship Award, an honorary doctor of laws from the University of Victoria and the NBA’s award for outstanding community work. As an NBA player and multiple winner of the Most Valuable Player title, Nash was one of the most successful basketball players of his time. His salary was on a steady increase, earning over $8 million per year. Besides owning a chain of fitness facilities (the Steve Nash Sports Clubs), Steve also made his fortune during his career with endorsements including a commercial deal with sports company Nike, Dove Men and Sprint. Steve Nash has a net worth estimated at $95 million. Steve Nash was formerly married to Alejandra Amarilla. The union which officially began in 2005 produced three children, twin daughters, Lola and Bella, born in 2004 and a son Matteo Joel born in 2010. However, Nash surprised his fans and raised eyebrows after he announced his separation from his wife of five years, just a day after the birth of their son. The pair has kept their fans guessing as one knows the full reason for their divorce. In September 2016, Nash who has since moved on got married to Lilla Frederick, a former Pepperdine volleyball player in Manhattan Beach. The couple welcomed a son, Luca Sun Nash in July 2017. As earlier mentioned, the former Canadian basketball player stands at a height of 6 feet 3 inches (1.91m). Best known for his high basketball IQ and excellent court vision, Nash possessed a good size, average strength and unbelievable balance and body control which made him one of the best point guards in history.